The quality of family relationships and youth friendships are intricately linked. Previous studies have examined different mechanisms of family-peer linkage, but few have examined social anxiety. The present study examined whether parental rejection and family climate predicted changes in youth social anxiety, which in turn predicted changes in friendship quality and loneliness. Possible bidirectional associations also were examined. Data for mothers, fathers, and youth (M age at Time 1 = 11.27; 52.3% were female) from 687 two-parent households over three time points are presented. Results from autoregressive, cross-lagged analyses revealed that father rejection (not mother rejection or family climate) at Time 1 (Fall of 6th Grade) predicted increased youth social anxiety at Time 2 (Spring of 7th Grade), which in turn, predicted increased loneliness at Time 3 (Spring of 8th Grade). The indirect effect of father rejection on loneliness was statistically significant. Mother rejection, father rejection, and a poor family climate were associated with decreased friendship quality and increased loneliness over time. Finally, there was some evidence of transactional associations between father rejection and youth social anxiety as well as between social anxiety and loneliness. This study’s findings underscore the important role of fathers in youth social anxiety and subsequent social adjustment. The authors gratefully acknowledge the contributions of the participating youth and families, and the PROSPER staff, to the success of this project. This project was supported by the National Institute on Drug Abuse (grant R01 DA013709) and co-funding from the National Institute on Alcohol Abuse and Alcoholism (grant R01 AA14702). Additional support was provided by the Karl R. and Diane Wendle Fink Early Career Professorship for the Study of Families (to G.M.F.). H.M. conceived the current study, performed statistical analyses, interpreted the data, and drafted and revised the manuscript; G.F. contributed to the conceptualization of the study, manuscript generation, supervised analyses, and manuscript revision; M.F. was a co-principal investigator of the original PROSPER study and provided feedback on this manuscript. All authors read and approved the final manuscript. All procedures performed involving human participants were approved by the local institutional review board. Informed consent was obtained from all parents included in the study. Wittchen, H.-U., Stein, M. B., & Kessler, R. C. (1999). 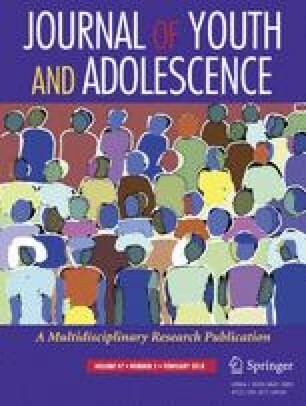 Social fears and social phobia in a community sample of adolescents and young adults: Prevalence, risk factors and co-morbidity. Psychological Medicine, 29, 309-323. https://doi.org/10.1017/S0033291798008174.